Hogs Back Brewery celebrated its fourth annual hop harvest with a party for more than 1000 residents, families, friends and members of the Tongham TEA Club. Despite rainfall on the day, spirits were high among the guests enjoying live music, a Kids Zone, street food, and of course plenty of Hogs Back beers – including Green TEA, made with freshly picked Fuggles hops – guaranteed a fun and memorable day for guests of all ages. This year’s party marked the final harvest from the current Hogs Back hop garden opposite the brewery, which is moving to a larger site back on Manor Farm, where the brewery was founded 26 years ago. The new plot behind the brewery is currently being prepared for hop planting and many guests viewed it by taking a short ride on a dray, pulled by Shire horses Cascade and Fuggles, named after hop varieties grown in the garden, who will help to bring in the hop harvest next year. 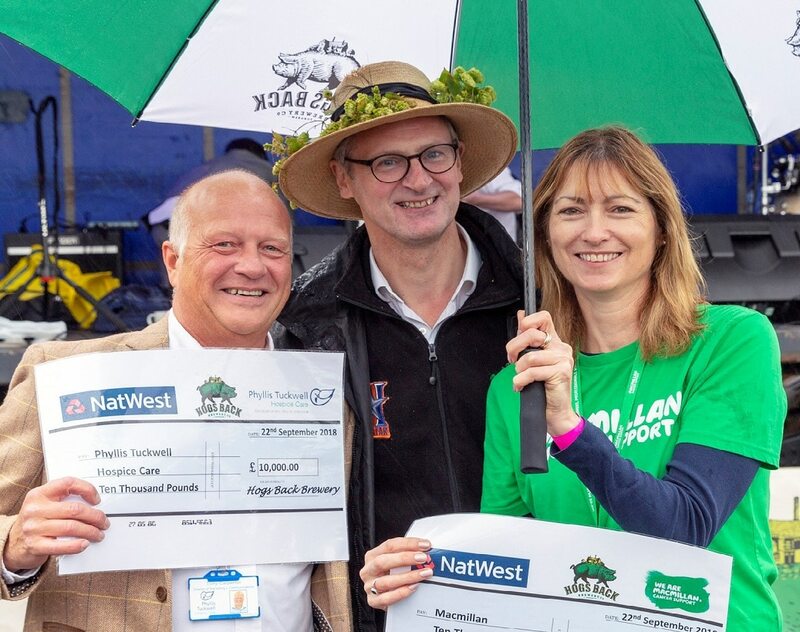 At the party, Hogs Back managing director Rupert Thompson also named local hospice care provider Phyllis Tuckwell as the company’s charity partner for 2018/19, presenting them with a cheque for £10,000. Hogs Back will aim to raise at least £10,000 more for the charity over the next 12 months. The second donation of £10,000 to Macmillan, the company’s charity of the year in 2017/18, was also presented. Thompson said, “We would rather have had the rain falling on our hop plants over the dry summer, rather than on guests at our Hop Harvest Party, but everyone had a great time nonetheless. The party was rooted in the local community with performances from local bands Don’t Fret – who headlined alongside modern pop and funk band Empire – 50s/60s band The Dolomites and Hampshire blues & roots player Grizzly Rhys Morgan. Indie rockers the Outcast Band completed the musical line up. Younger visitors were able to make their own music thanks to the Rock & Pop Foundation within the expanded Kids Zone, which also offered a Bouncy Castle and face painting. And party guests of all ages took part in the Hop Garland competition, won by Christina Audrain of Southsea. Several local businesses and groups were involved in making the event a success. Barbecue Chefs cooked hundreds of locally-made Alf Turner burgers and sausages, and Stromboli brought an Italian theme to the day with their mouth-watering made-to-order wood-fired pizza, alongside paella from StreetfoodSpain, new for this year. The stage was kindly donated by Hi Speed Services, and Hedgehogs capably built and took down marquees. Volunteers from SamFest welcomed everyone on the gate and the 4 Farnham (Tongham) Scouts directed cars and manned the Kids Zone.